The Work That Reconnects helps us uncover and experience our innate connections with each other and the healing powers of the web of life, so we can discover our role in creating a life-sustaining civilization. Pioneered by root teacher Joanna Macy in the late 1970’s, this highly experiential and interactive work draws from systems thinking, deep ecology, and many spiritual traditions. 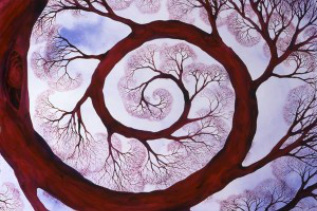 The Spiral of the work moves through Gratitude, Honoring Our Pain for the World, Seeing with New Eyes, and Going Forth. · Learn new stories and concepts to communicate and understand the challenges of our time. · Reconnect to the wonder and beauty of this earth. · Rediscover our joy, our creativity, and the gifts we bring to our communities. · Move through our grief and fear to our love and courage. · Find power in our interconnectedness with both the human and non-human world. · Shift our perception of what is possible. · Embrace this time on planet earth as a great adventure that is asking us to step up and be heroes. · Clarify our vision of how we can act for the healing of the world. “ Simply being present and attentive with a group of people who are committed to this work, is inspiring and restorative for me. My connection with the world (within and without) feels deeper…." We face many life-shattering crises today: climate change, income inequality, environmental destruction, institutionalized greed, to name a few. These crises are more than we can bear alone, so let us come together to share our despair, our dreams, and connect with our passions to participate in Great Turning. As teachers, parents, grandparents, business leaders, counselors, activists,and community members we need to talk about what is happening on the planet in ways that inspire action, creativity, and hope. We need to inspire ourselves so we can build community cooperation and resiliency to navigate the bumpy road ahead. Special Guest Teacher Joanna Macy will join the retreat for a day to share new insights and practices on the Work That Reconnects. Co- Leader Molly Young Brown, M.A., M.Div, co-authored Coming Back to Life: The Updated Guide to the Work That Reconnects with Joanna Macy. She brings ecopsychology, psychosynthesis, and systems thinking to her work teaching on-line courses, writing books and essays, phone coaching, talks and workshops. Other publications: Growing Whole: Self-realization for the Great Turning, Held in Love: Life Stories To Inspire Us Through Times of Change (co-editor Carolyn Treadway), and Lighting A Candle: Collected Reflections on a Spiritual Life. Web site: MollyYoungBrown.com. Deposit: $200 deposit due at time of registration. Teachings are offered on a donation or dana basis. ( Dana is the Pali word for generosity or giving from the heart.) At the retreat you will have the opportunity to offer what you can for the teachers and retreat coordination. We have limited scholarship funds but if you are unable to afford the lowest rate room please contact us about a possible scholarship.